Yay!! 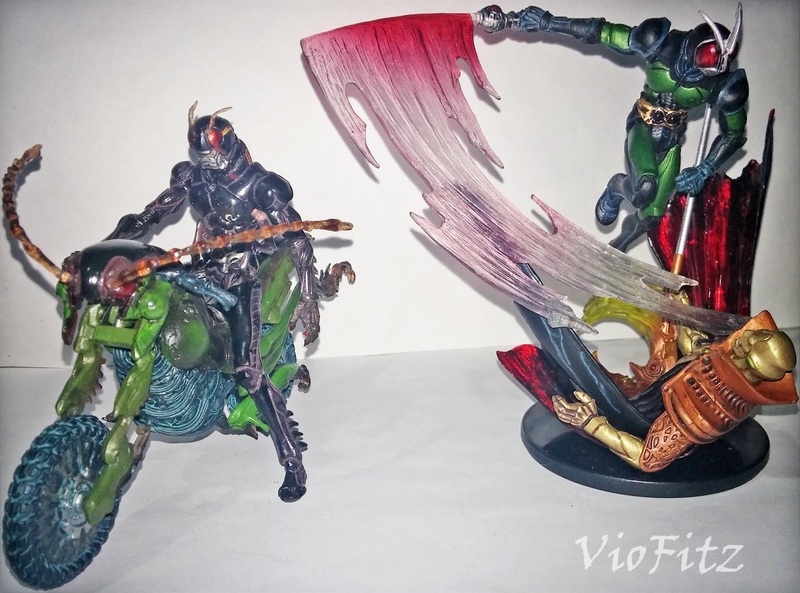 Finally get to do a review my first owned 66 Action figure series & another review of S.I.C. 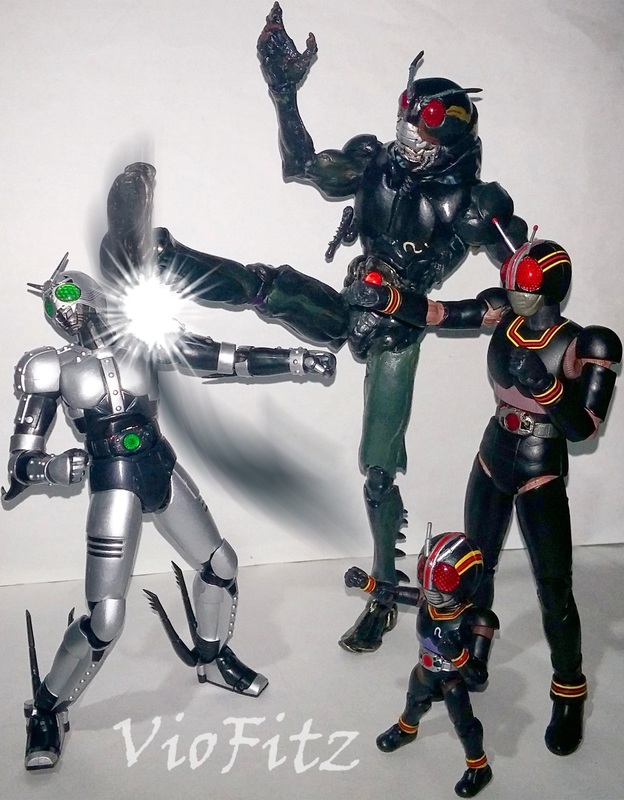 Takumi Damashii, featuring 66 Action Kamen Rider BLACK & S.I.C. Takumi Damashii Battle Hopper. 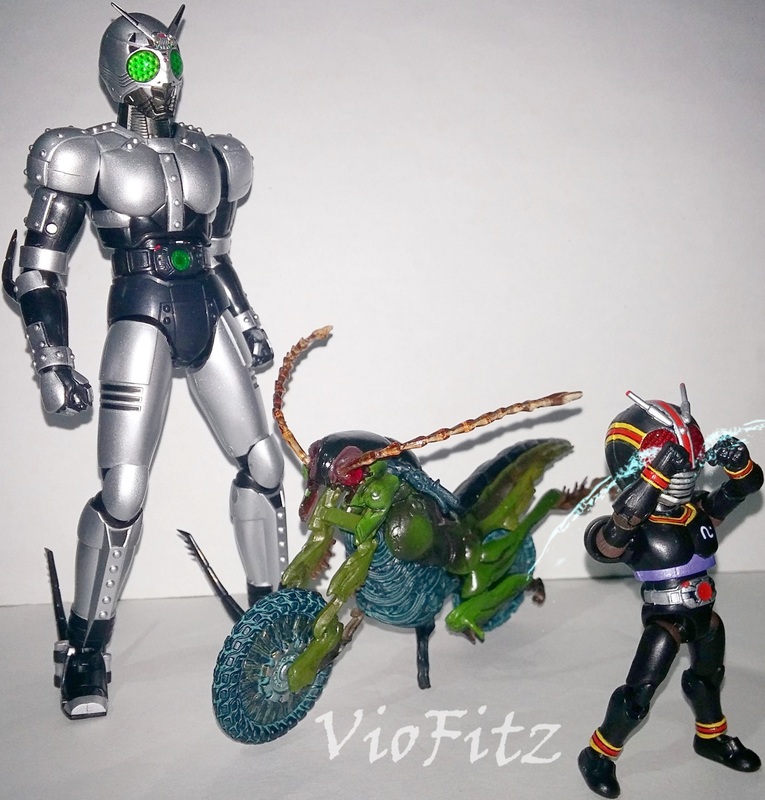 Well, guess you should have very familliar with this series on my Kamen Rider figure reviews. 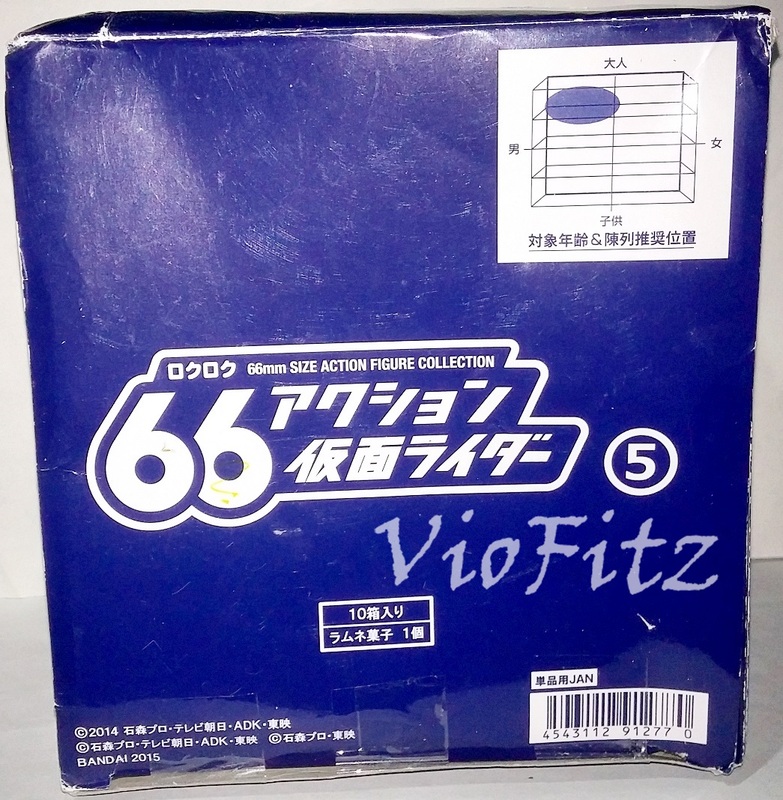 66 Action Kamen Rider BLACK comes in set of box of 66 Action Kamen Rider Vol. 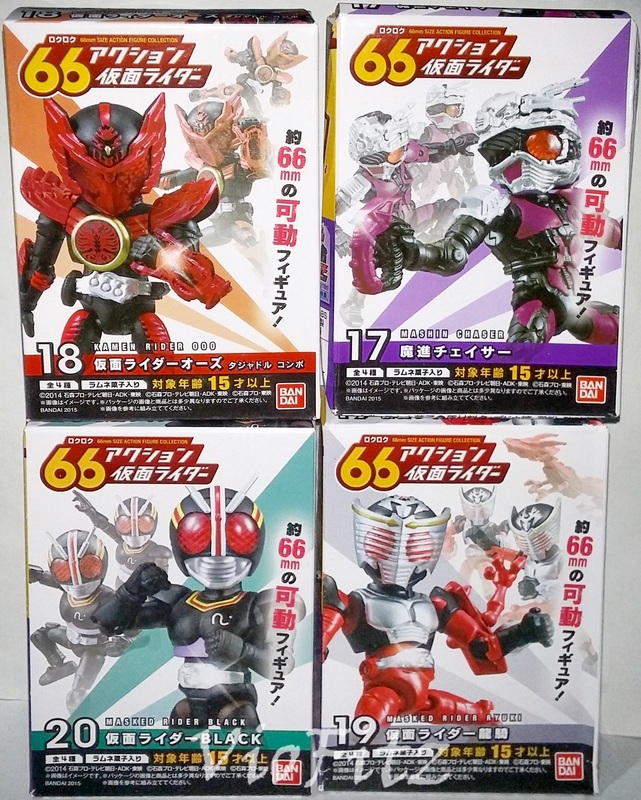 05 containing 8 figures in total, & there’s 4 kinds of Kamen Rider series. 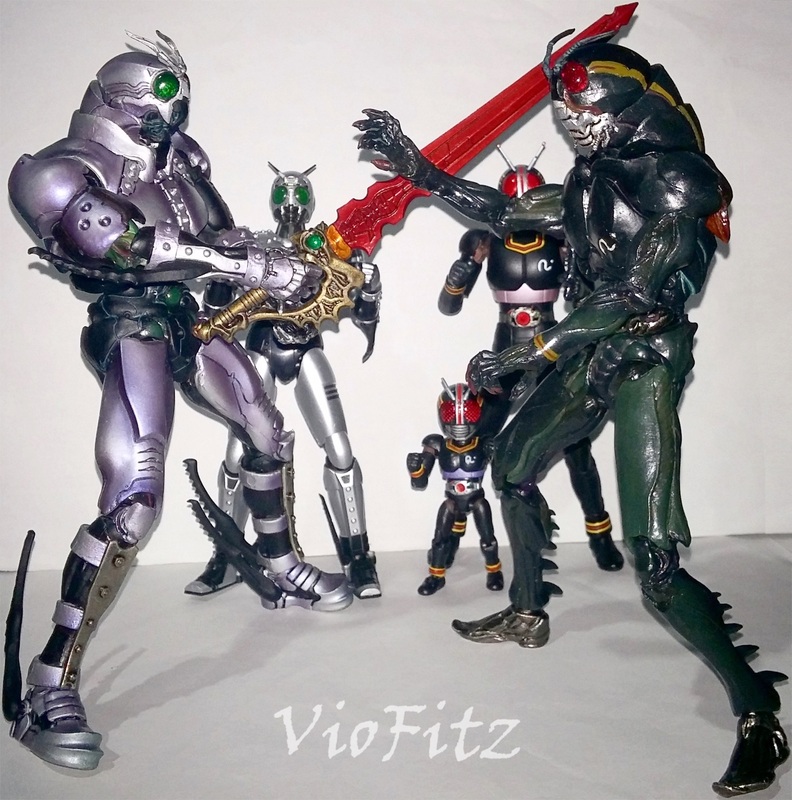 They are 2 Kamen Rider BLACK (20), Ryuki (19), Tajadol (18), & Mashin Chaser (17). But, I’m going to review BLACK only & my long owned S.I.C. 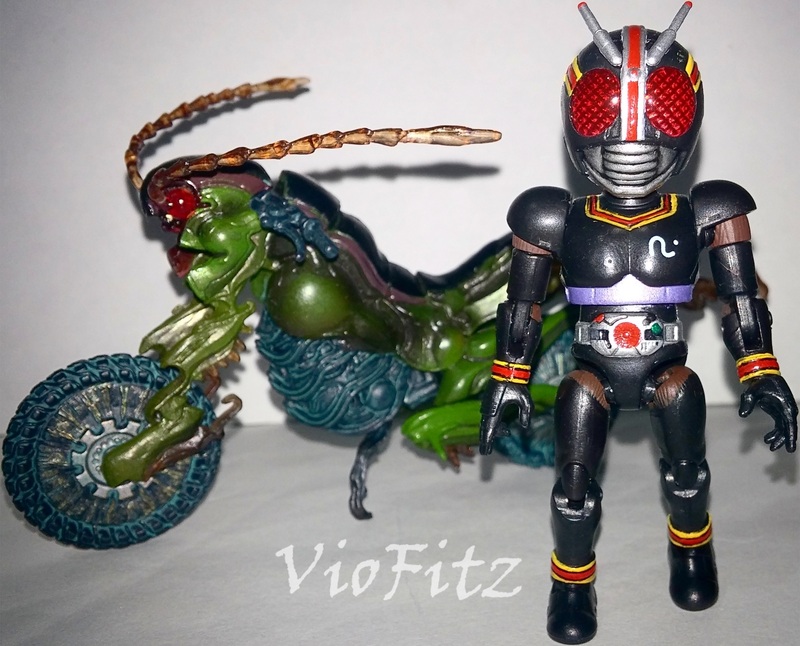 Takumi Damashii Battle Hopper, this Battle Hopper was released somewhere in 2006 & is one of the line up part of Vol. 07 of S.I.C. 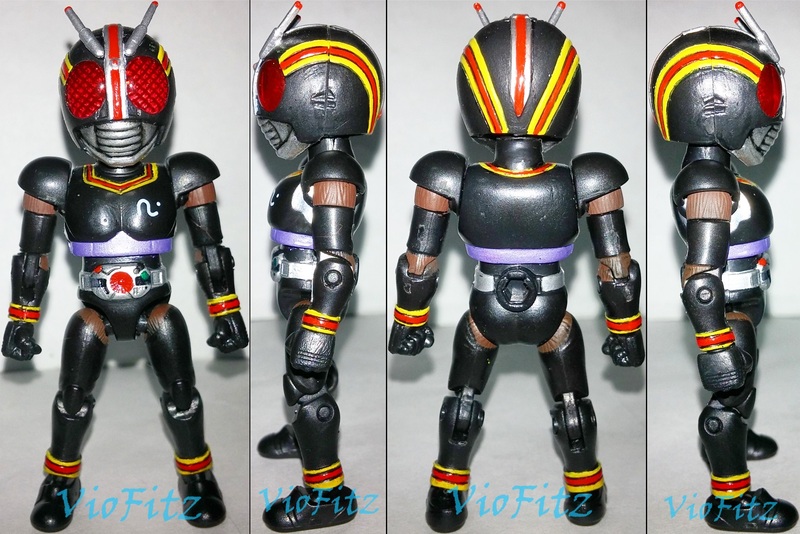 Takumi Damashii where it comes along with TD BLACK but, sold separately. 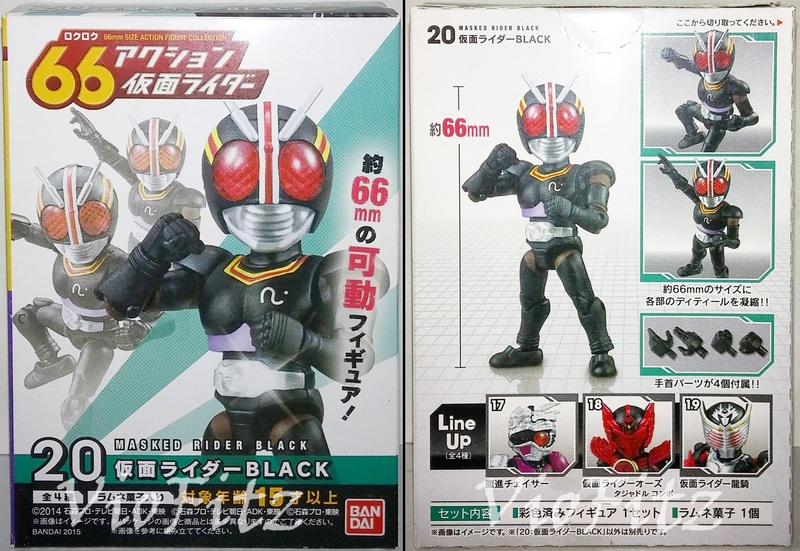 Now, 66 BLACK’s box was overally colored white, it also got dull green lines, and black lines for Bandai Informations in Japanese. 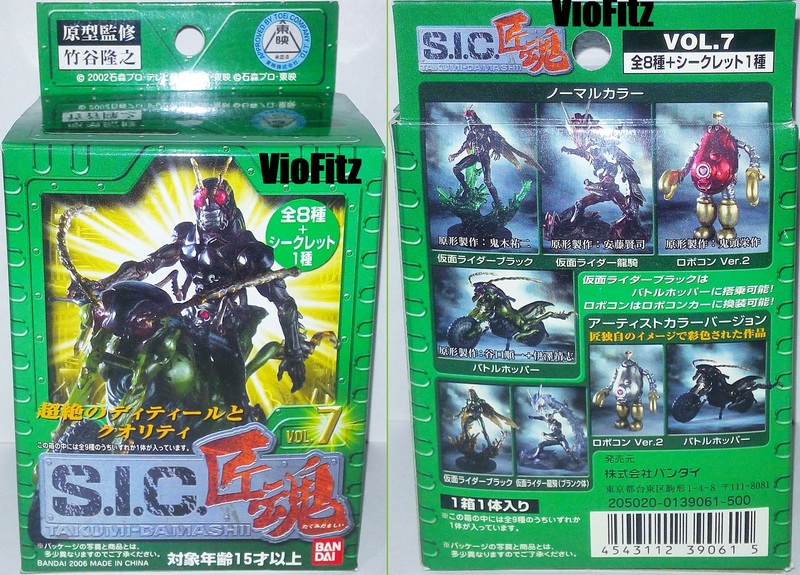 The boxart mostly got the photo of 66 Action BLACK figure & there’s 3 respective riders from vol. 05 featured in the back as part of the line up. 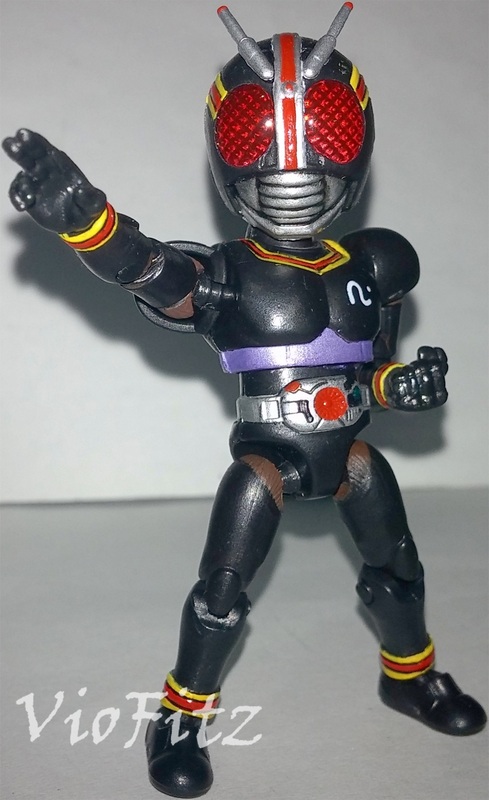 As for TD Battle Hopper, since he’s also part of the volume 07 line, he has the exact same box like in my TD Kamen Rider BLACK. Both figure’s box got no window so, we cannot see the contents. Well, let’s take a look inside then. 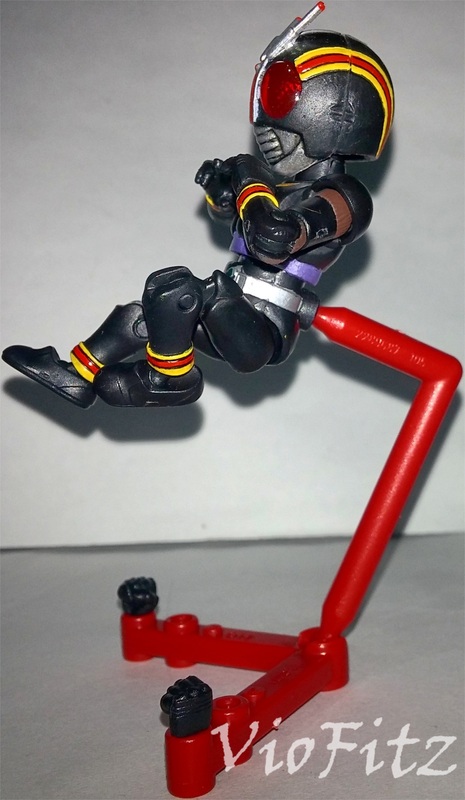 66 Action BLACK comes with 2 pair of preassembled variant hands, preassembled display stand, & 1 candy. Also, BLACK was headless since the head was put separated before we open them… While S.I.C. Takumi Damashii Battle Hopper actually doesn’t comes with extra accessories but, rather separated part of it’s body, antennas, & front body. 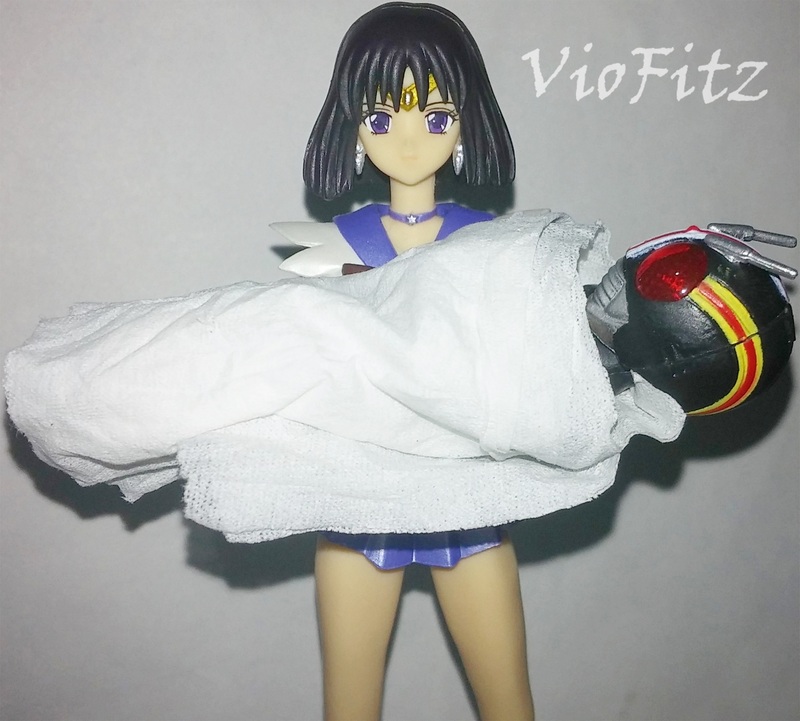 Despite being a candy toy, the toy/figure was meticulously made on the sculpt & even fully articulated like S.H.Figuarts. 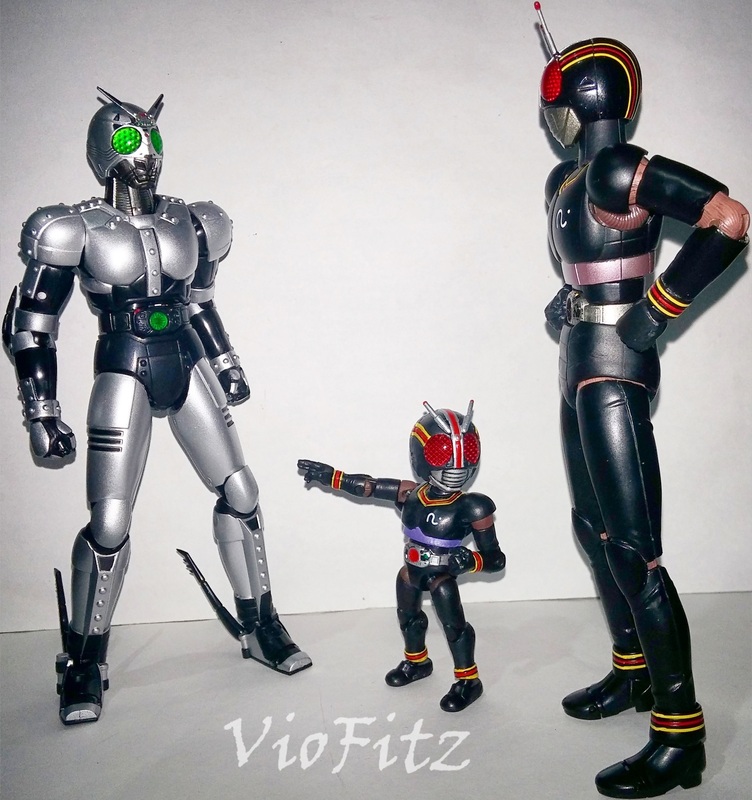 I’d rather call it Mini SHF because of their small size/chibi style but, unlike SHF they lack paintjob details screw this pic because, I tooked this picture after repainted him. I’ll show you the exact original pic of him below. 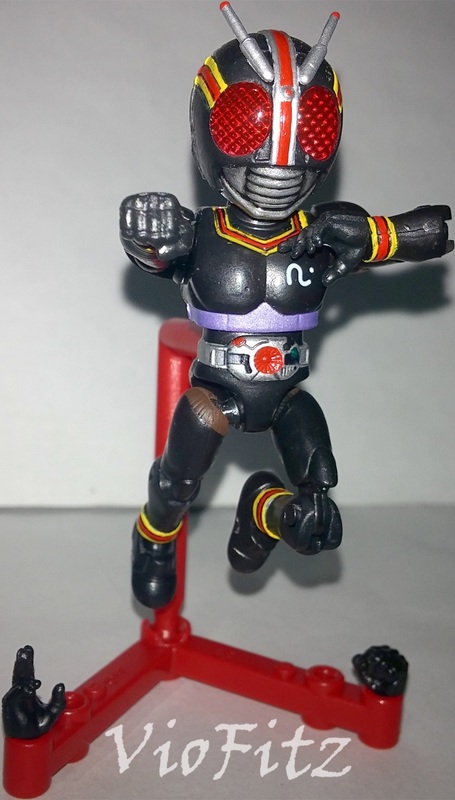 This Mini BLACK approximately got 16 points of articulation, making him poseable enough to do many kinds of dynamic posing. However, articulations sometimes can loose especially on the crotch but, they can still atleast balance the weight depending on how we pose him. Also, why he’s called 66? Because the size of him is 66mm or 6.6cm. This is how TD Battle Hopper looks after we assembled it & just like line of this figure, Super Imaginative Chogokin!! TD Battle Hopper was made to be darker than the original one, of course S.I.C. focusses on imaginative design on the figure & they usually based on their manga version. But, funny that in the manga itself Battle Hopper actually looked identical like the TV one, the bike was sculpted by Takayuki Takeya. 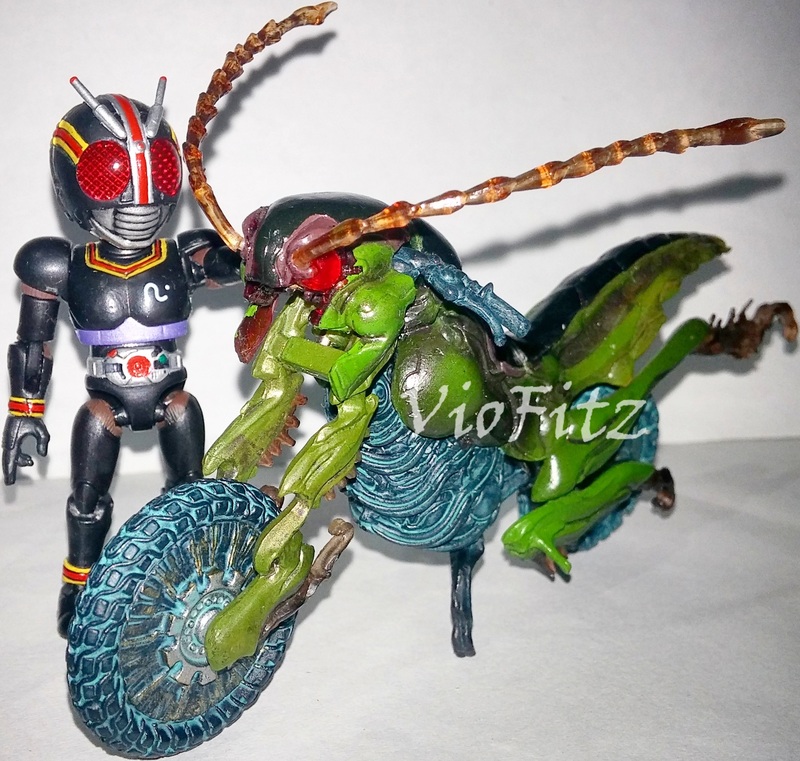 In this version Battle Hopper got more bug looking & organic design, as you can see from it’s body resembles very much like grasshopper just like the rider in S.I.C. version. 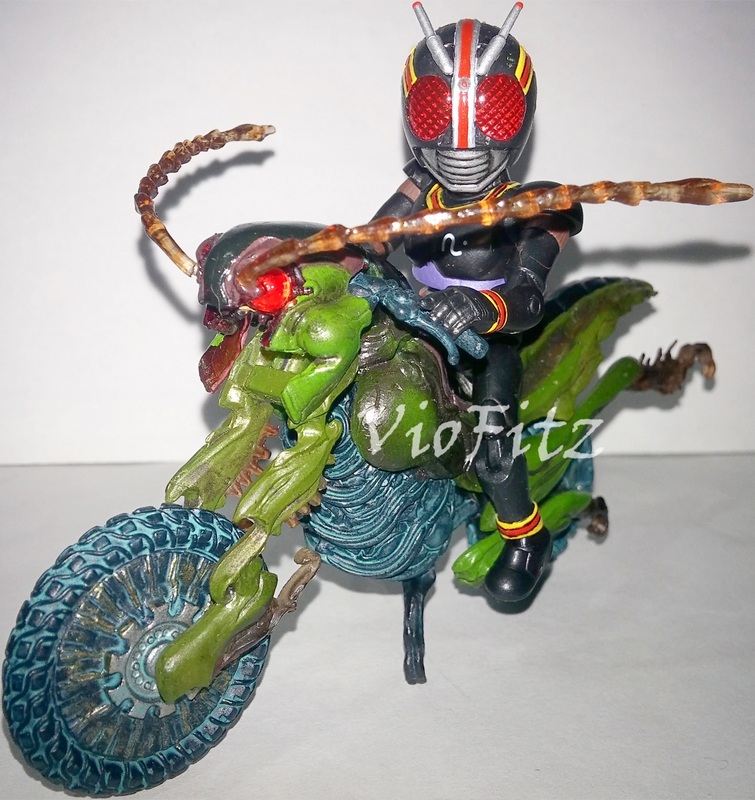 Hmm… Pretty nice details on the helmet sculpt, I’m loving the compound eyes, mouth, & pinstripes. 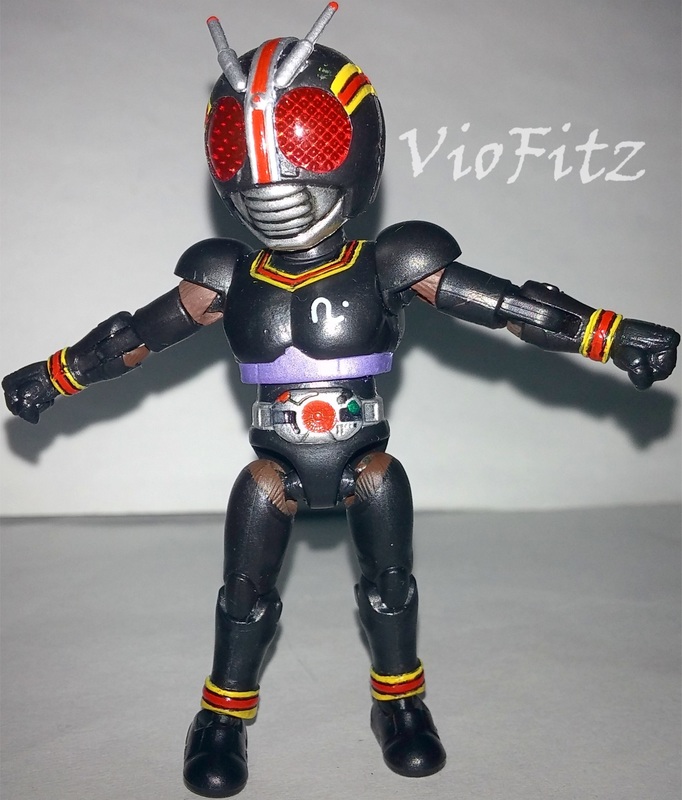 & like I’ve said the actual toy/figure lacks some paintjob. On the front view, you can see the red striping on the center is completely false as the forhead circular was merely painted straight red line. On the back view, the center stripes are plain black or unpainted & the pinstriping on the side view was just simply painted yellow & red, & there’s no black lining on the stripes. 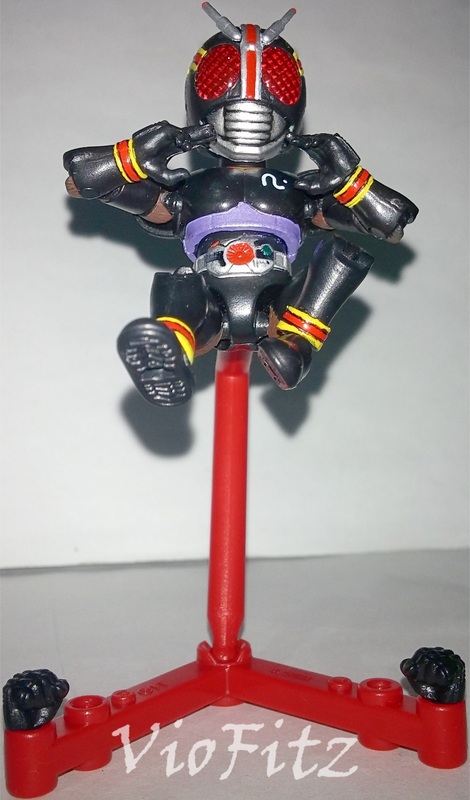 The silver antennas are made sticky to his head, not straight strands like in the show & funny thing that the side of his antennas near the white stripes were silver colored, contrast to the boxart pictures which is black. 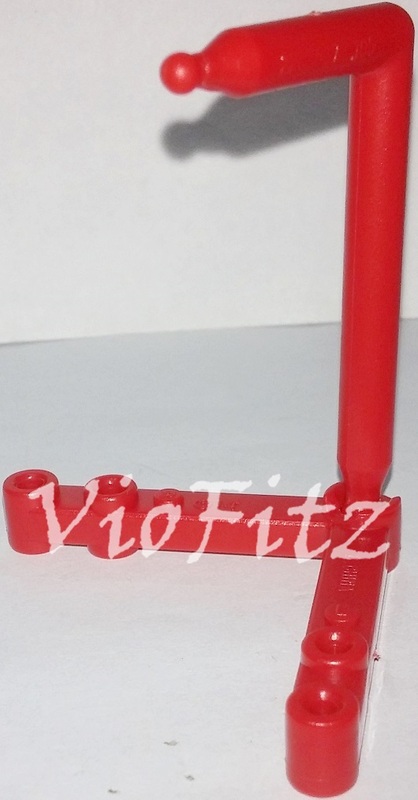 Well… What do you expect more for a candy toys, right? It’s pretty forgiven I guess, atleast Bandai & Shokugan put a good effort on this. But, still… I feel like this effort was fruitless since it looks unfinished, so better repaint him like this! 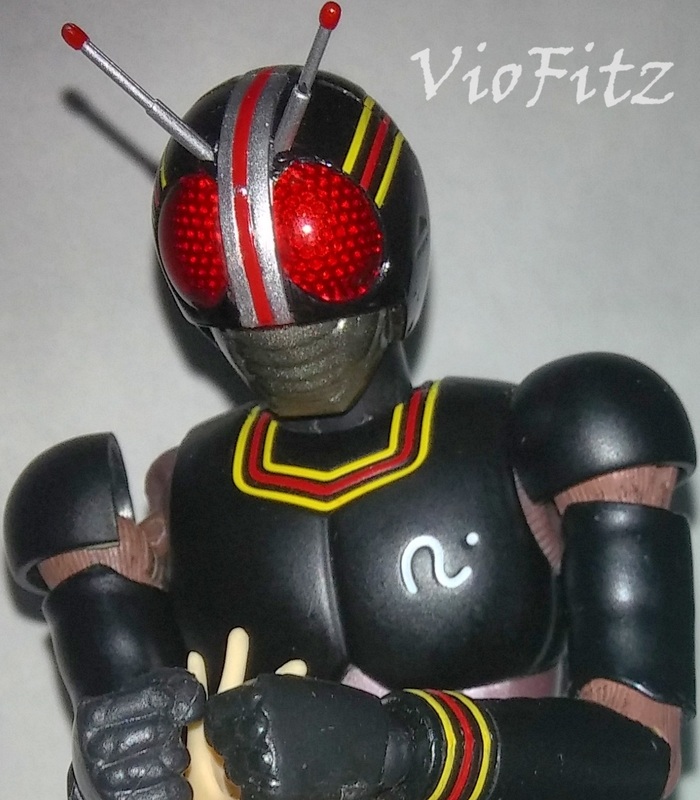 With this repaint, 66 BLACK looks very true to the show & now he looks more like a real Mini SHF. TD Battle Hopper’s head was beautifully well made, I liked the compound eyes & sculpt details on it’s head. although I don’t really like looking it on the front because I can’t see it’s eyes because of the antennas. It’ll be great if they just put the antennas above the eyes, so we can see it’s eyes on the front as well. The antennas are movable, we can rotate them 360 degrees. Also, there’s a teeth in it’s head, I’d say it’s a nice details but, it’d be great if there’s an articulated jaw for it. So we can open Battle Hopper’s mouth. Front, Back, & 2 Side View. Now, he looks more eye catching indeed! Repaint thanks to Cluster Model Kit. We got movable head that can be rotate it 360 degrees. 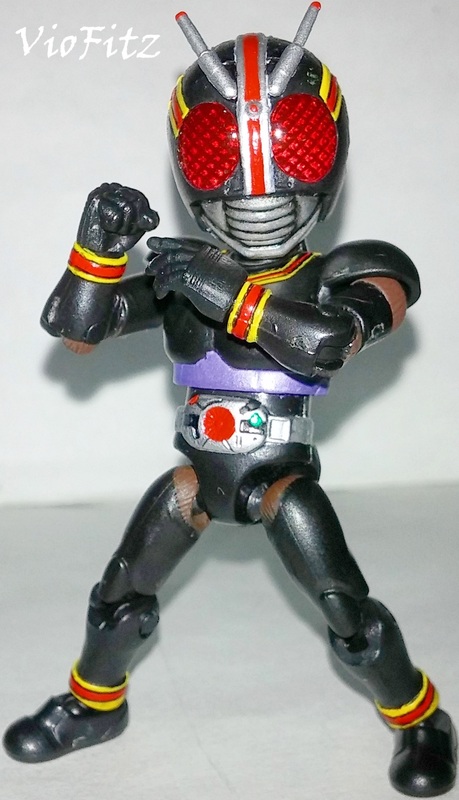 BLACK also got upper bicep cut joints & creating crossed arms pose is a piece of cake. But, there’s no butterfly joints on the shoulders so we can’t make him do the close hug arms. 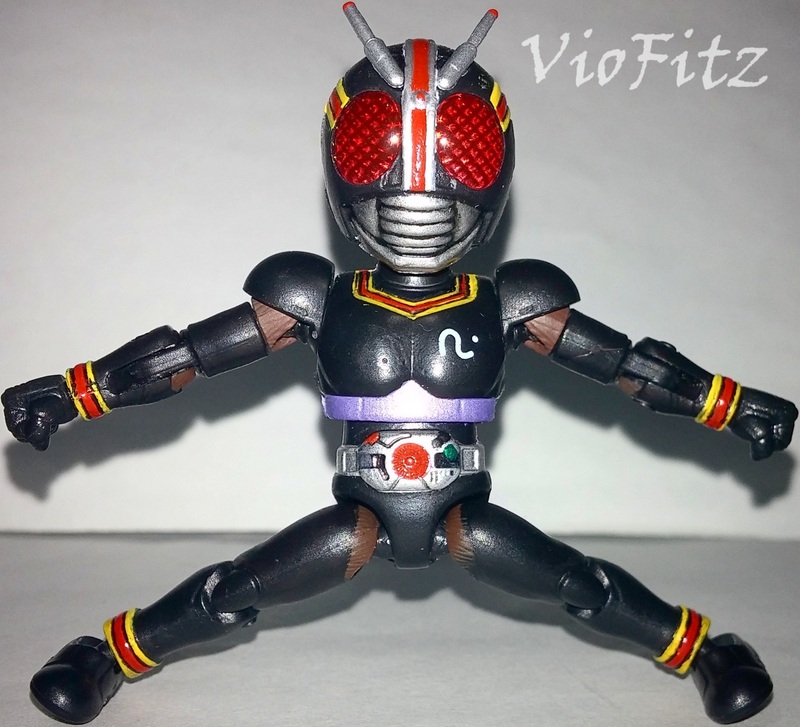 With him could do this so, we can create alot of dynamic posing for him… However, like I said earlier his crotch joints can be loose so, if you want to recreate dynamic posing like kick you’ll have to rely on his display stand. Other than that, he’s fine. This is how TD Battle Hopper looks from certain angle, it looked sleeker than the original & yet so organic. The details… Very2 intense… I’m loving how Takeya sculpted on the grasshopper body like especially on the back, & the front lower body… The bike was painted mostly green with dark shade, black colored line on the upper body, purple to red-ish colored lines besides the black line, black with cyan-ish colored side stand, cyan with black colored lines on the lower body, handlebars, & tires. Also, the antennas, hopper feets on the front tires & on the back was made with clear colored dark choccolate to red-ish. & don’t forget that red compound eyes & it even got a mouth, very nice details for a small figures. 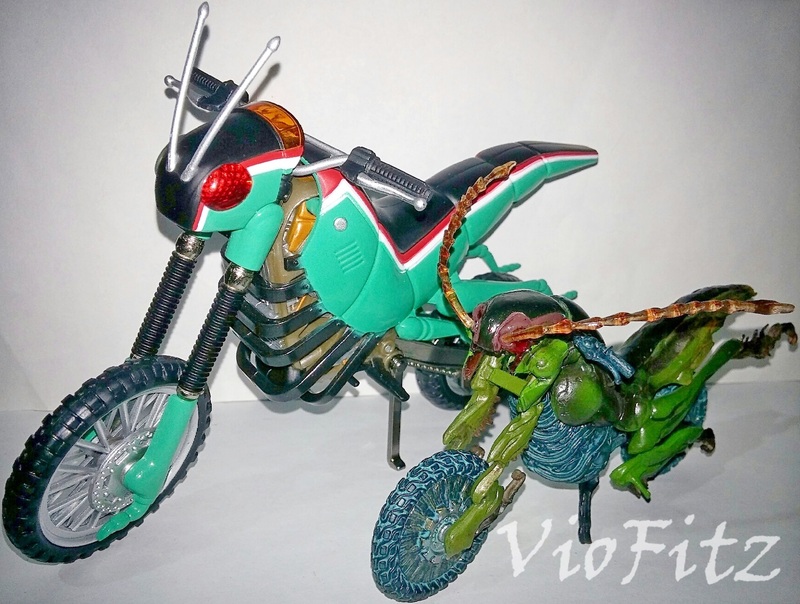 Articulations works exactly the same like other bike figures, moving forks, wheels & side stand but, only in TD Battle Hopper, he got rotateable antennas. 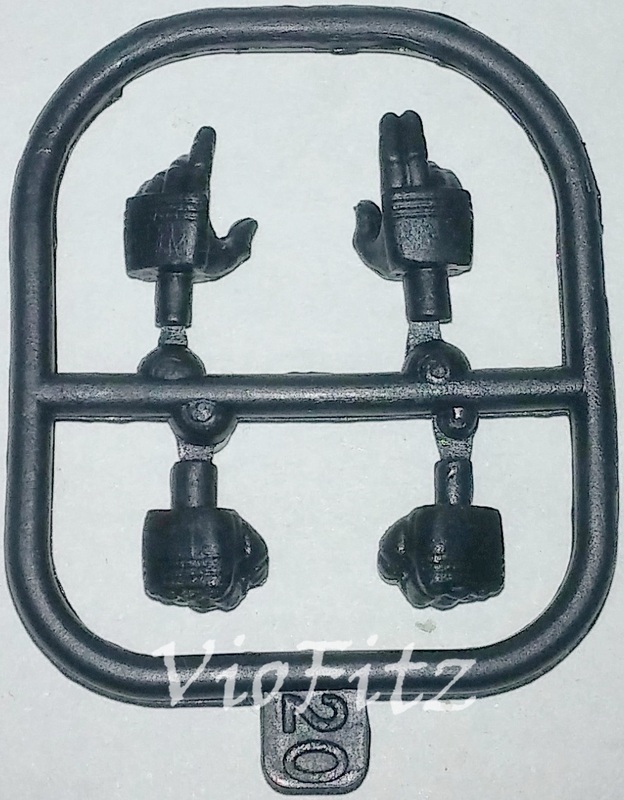 66 BLACK is given with preassembled 2 pair of option hand parts, to attach them is very simple. Unlike SHF figures, this 66 Action uses peg jointed & the hands can only be rotate it 360 degrees, you cannot bend them down or up. The hands consists a pair of fistful hands & 2 variant pair of gesturing hands. All hands are pretty obvious for us to know that BLACK only fights bare handed in the show, except in the last episodes where he uses ShadowMoon’s Satan Saber. 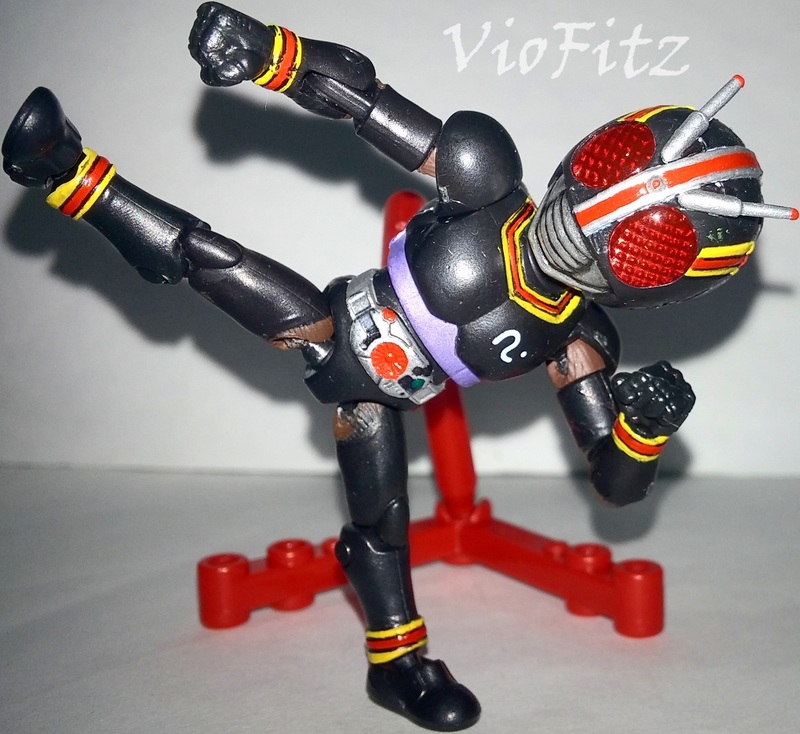 66 Action also comes with display stand, which allows various poses to be taken. 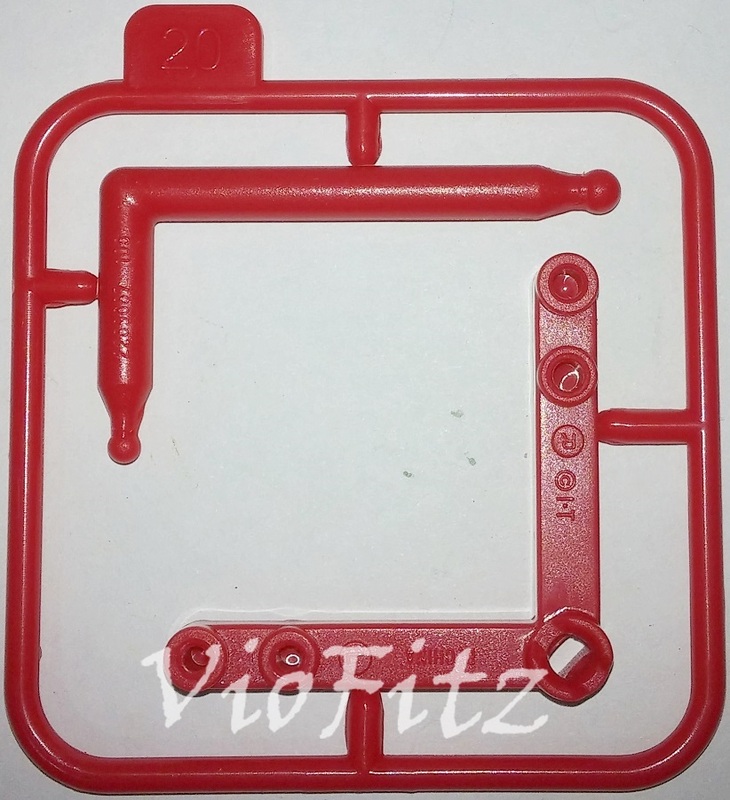 The stand is articulated, we can bend it down/up/right/left & we also be able to put 4 pair of his hands in the peg hole included on the display. A Candy? Hmm… Yeah, 66 BLACK it’s a candy toy afterall so, he’s included with candy inside the box. 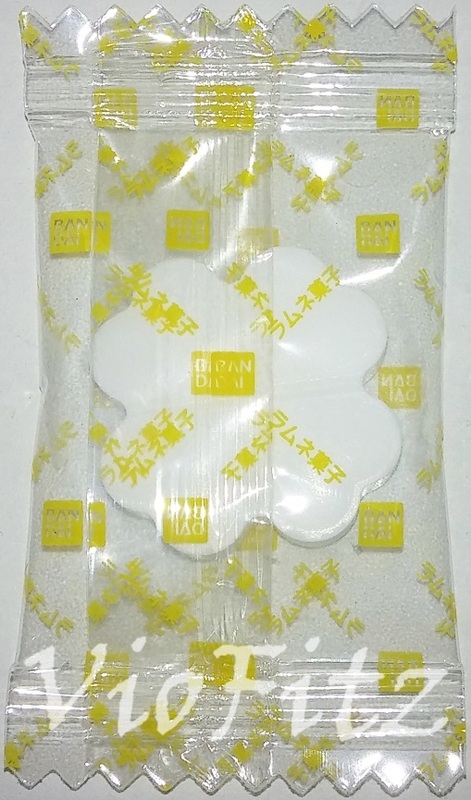 The candy was sealed in a clear plastic with Bandai’s logo & some Japanese words, & you can already tell it shaped like a clover 4 leaves. Have to admit, it tastes good it’s dominantly sweet but, there’s also a little sour like a fruit. It’s not like your regular candy which is usually oversweet… Come to think of it, this is my very 1st time reviewing a food in figure review. Actually, this brings back memories back in junior high school where I used to buy candy toys which always gambling on the contents since they’re put randomly. My S.I.C. Takumi Damashii’s Collections. 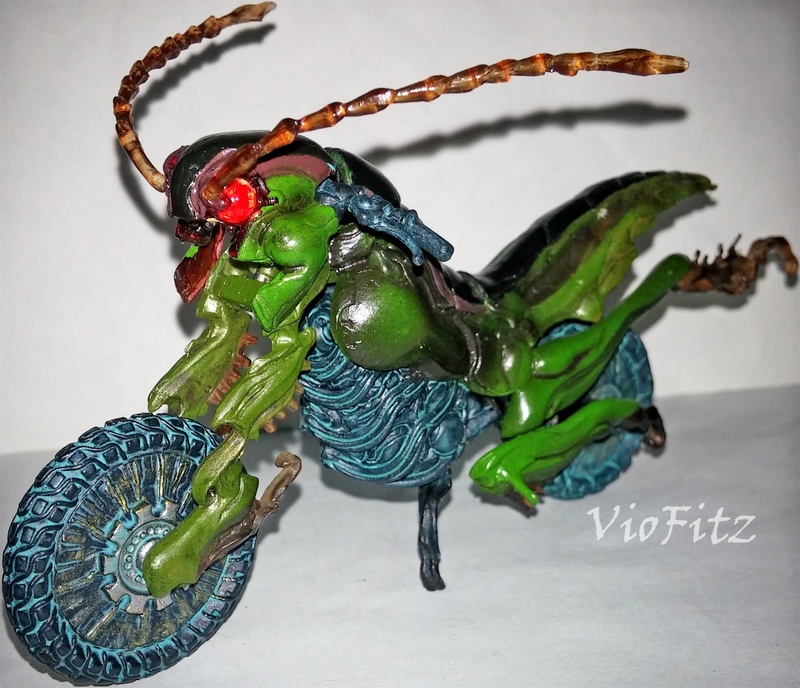 Yeah, if you want a real rider for this Battle Hopper, you’re going to need S.I.C. 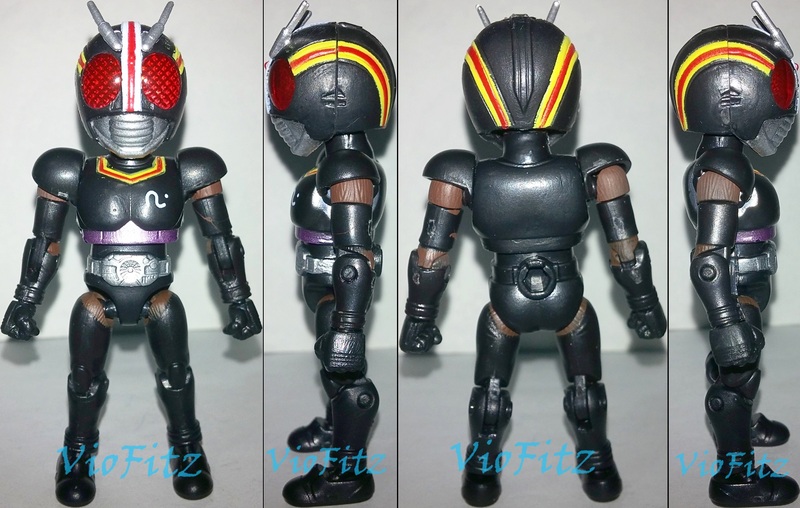 TD Kamen Rider BLACK in order to make him ride. 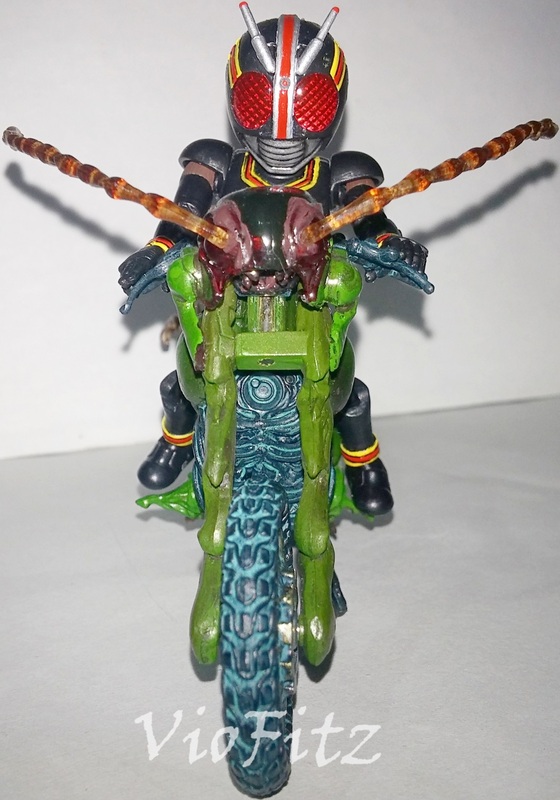 To make him ride you’ll have to change TD BLACK’s arms with the extra arms that allows him to grip the right handlebar. Check my S.I.C. 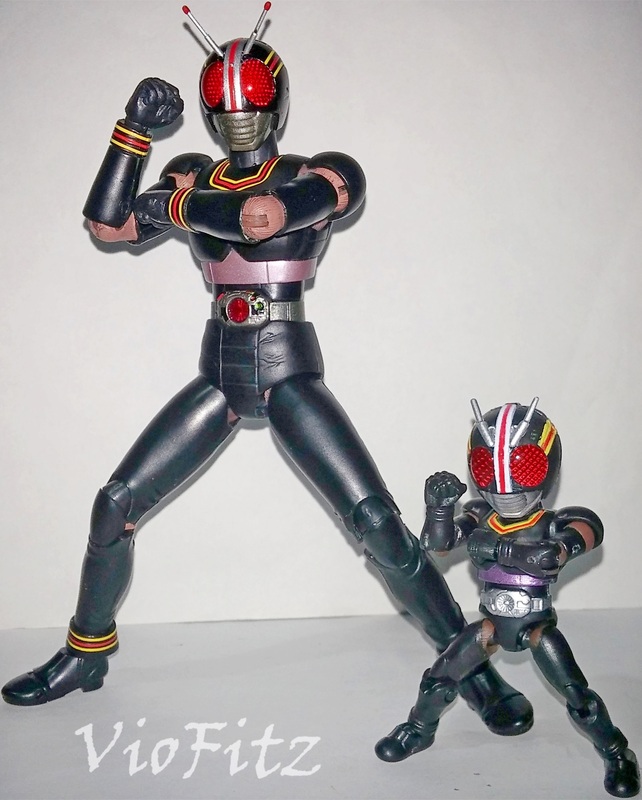 Takumi Damashii Kamen Rider BLACK & Kamen Rider BLACK RX review. Surprisingly, 66 BLACK can ride this bike perfectly, you can see his hands gripping both handlebars! Eventhough, the bike is a little too big. Well, if you’re wondering why I mixed up the review between 66 & TD is because of this. 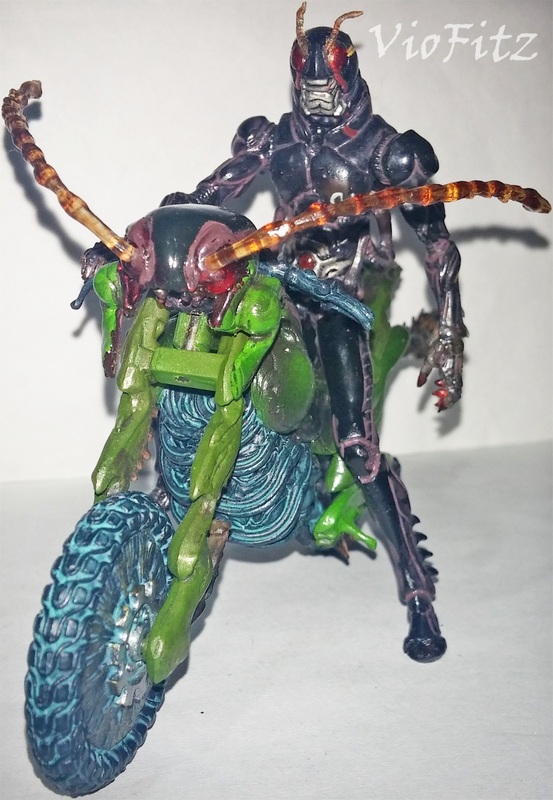 I mean come on… This bike is great & fully articulated like how other bike figure works but, why the original rider was instead a semi statue?! Ahh, I really enjoyed reviewing this figures, although it’s slightly disappointing because the lack of the paintjob details on 66 BLACK but, it’s a candy toy afterall so, deal with it. 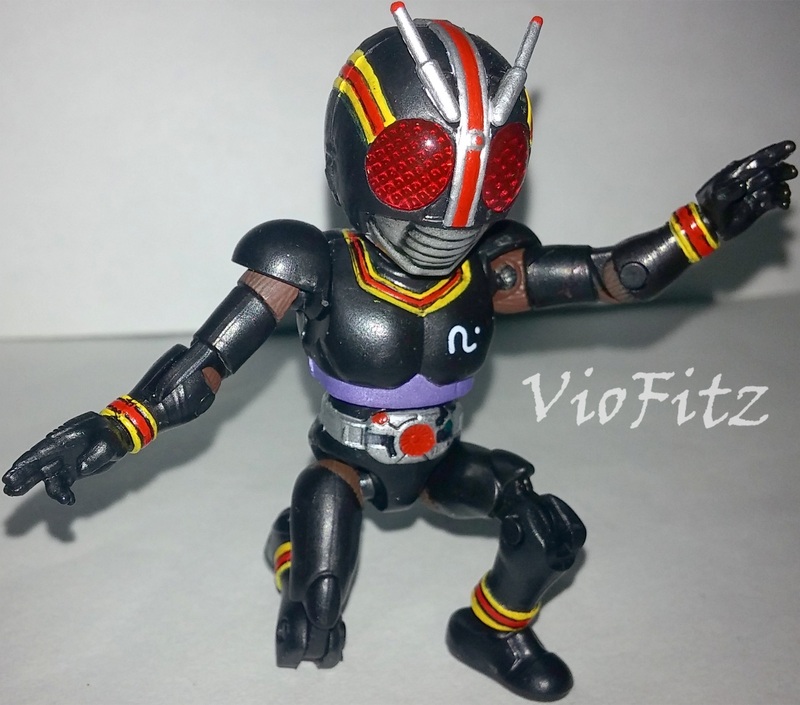 If you liked Kamen Rider BLACK in Chibi form fully articulated, then this is your good choice to get. 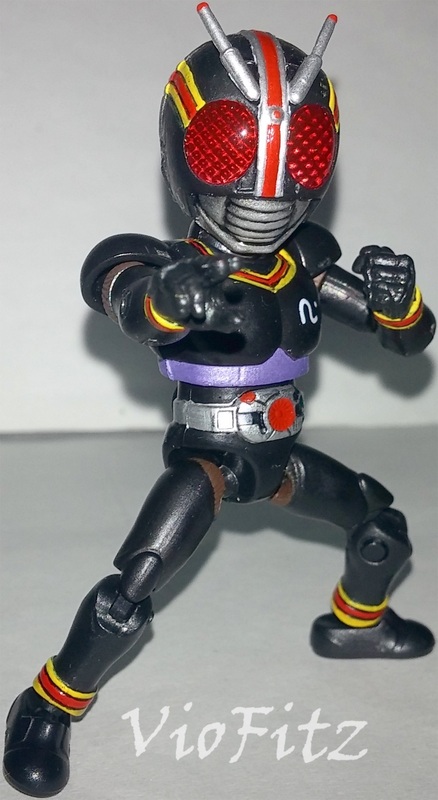 As for TD Battle Hopper if you liked imaginative form or dark looking design of Kamen Rider BLACK, I recommend you to get this. Well, now I’m waiting for the upcoming 66 Action ShadowMoon. 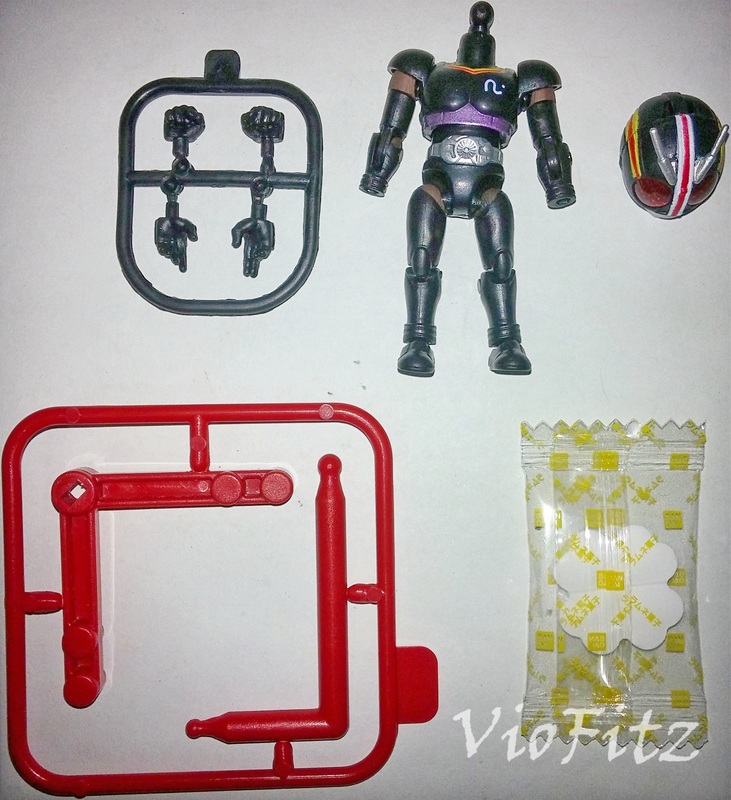 Fully articulated for a small figure. Intense sculpt work & paintjob. 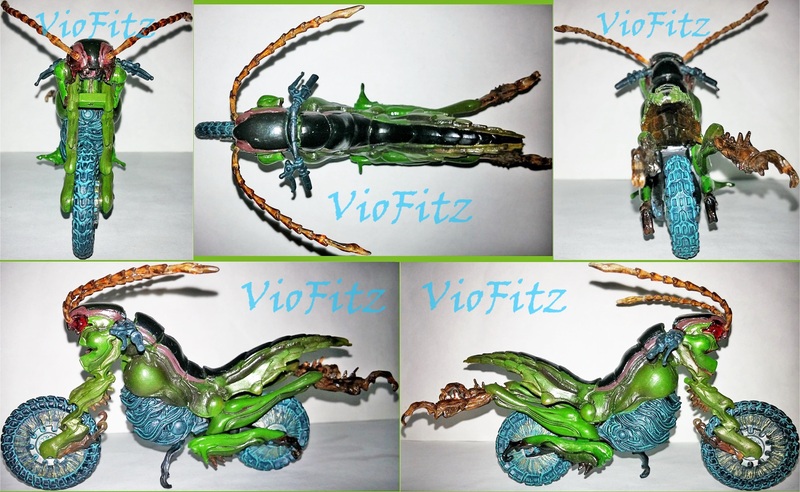 Fully articulated for a small bike figure. Very limited movements on the waist. Loose joints on the crotch. No extra accessories at all. 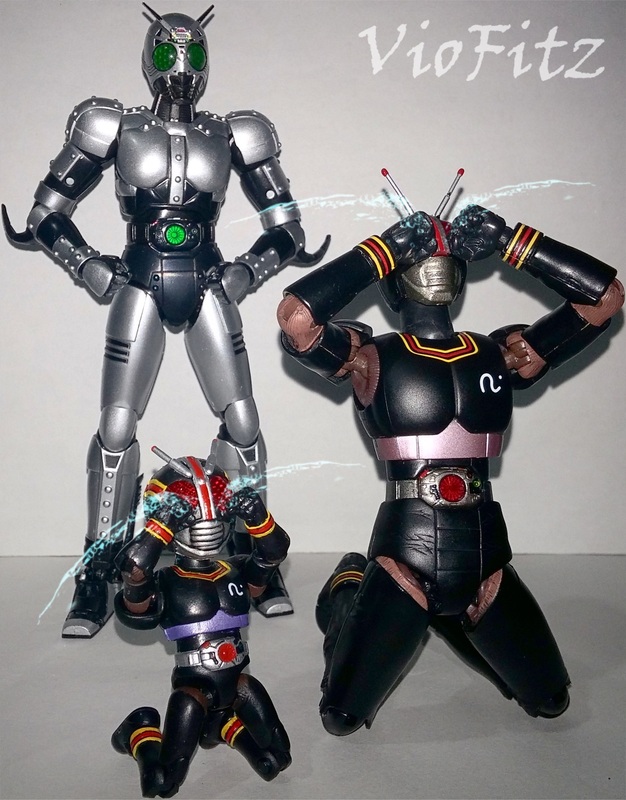 They should atleast give TD BLACK extra leg & arm in here, to make a real riding pose. Oh, no… What’s wrong with Nene?! So, she’s pregnant, eh? 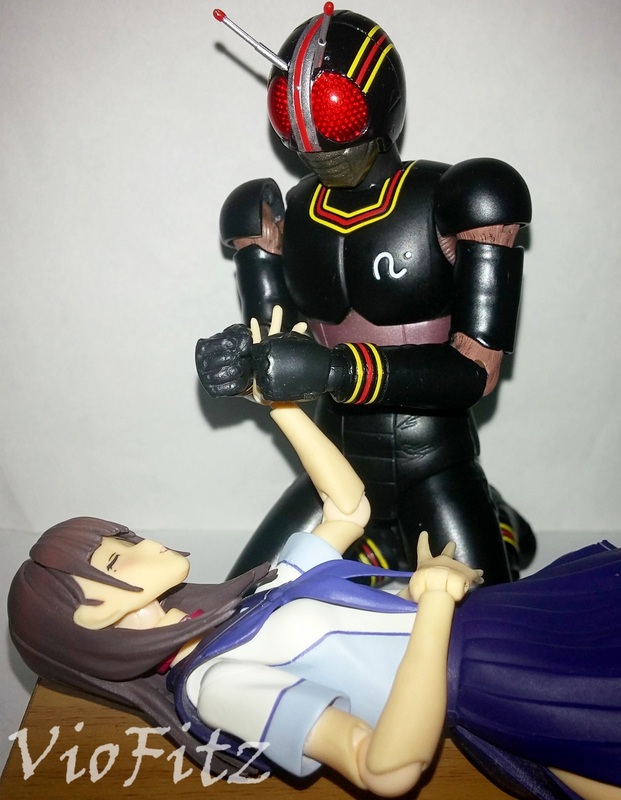 I didn’t know figure can give a birth…. HEY?! He’s just a kid!! hi! 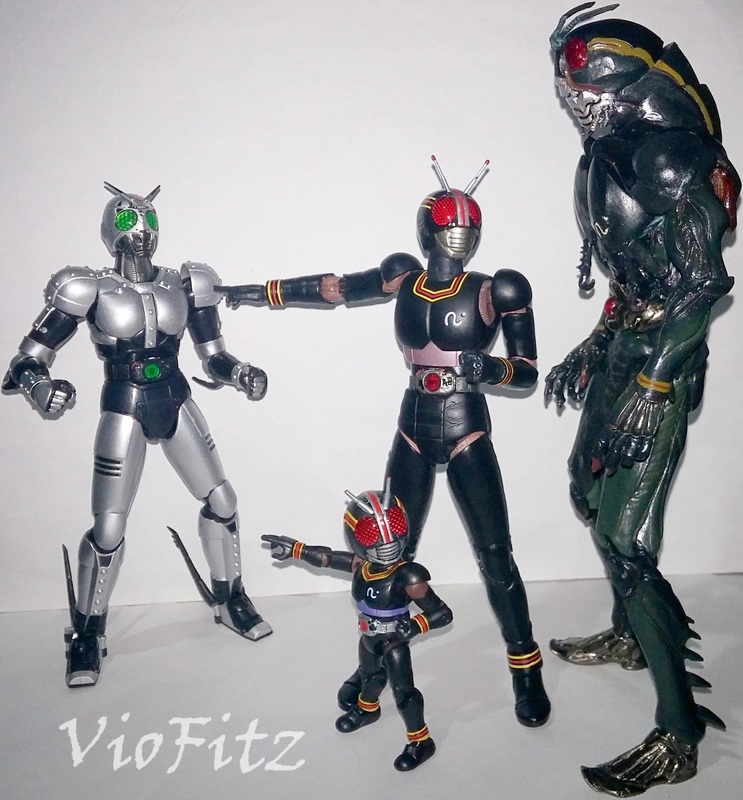 nice review man.. i love the way you repaint all the itsy bitsy tiny details on black’s belt, wrist & ankle stripes and also the helmet.. i wonder when will you review 66 action shadowmoon.. is there any mod to be done to make it more detail? Hello! 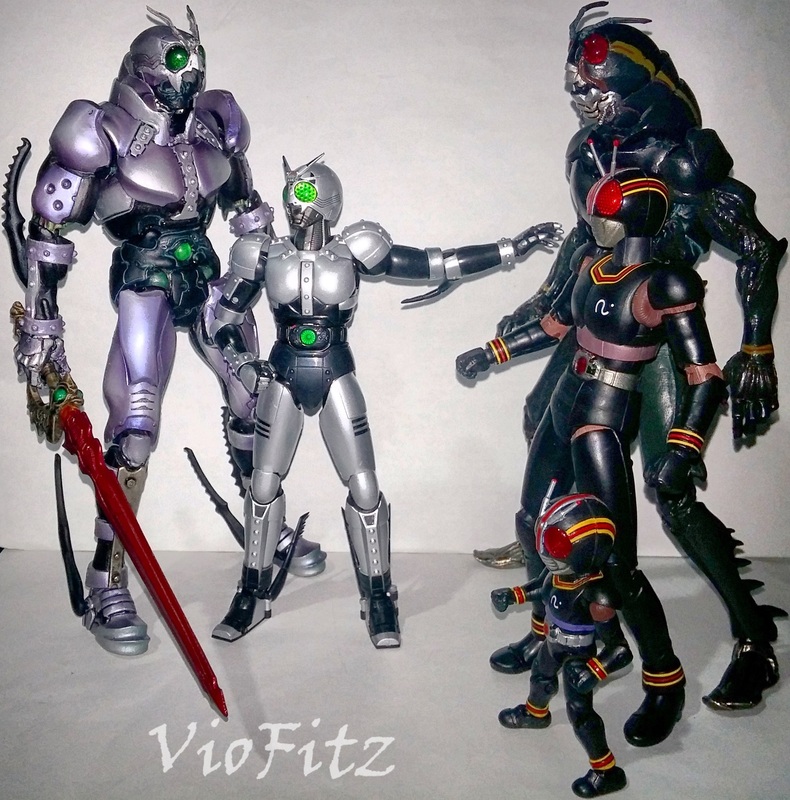 Thanks, man.. 66 action ShadowMoon is still under repaint process… There will be 2 ShadowMoon that will get a repaint process, 1 the original version & the other one will loosely based on the S.I.C. Another ShadowMoon color with the RX saga saber repainted the same for original version to recreate ShadowMoon with Twin Sabers. Yes, there are many of ShadowMoon’s details that lacks paintjob, I’ll point out on the review later.